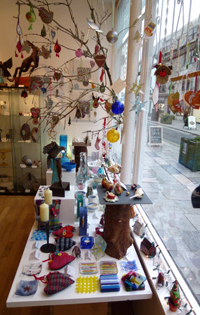 It is looking a lot like Christmas in the gallery and the street. The Christmas lights on Southside look very festive and even the Prawn on West Pier is lit up. 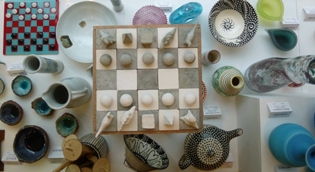 We have so much new work there is a great selection for every budget. 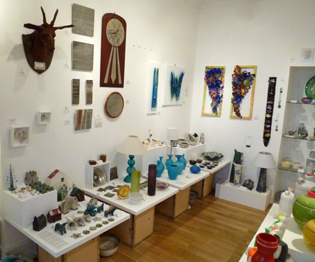 Items on display change all the time, make sure you keep popping in to have a look. There is so much to choose from. We have a great selection of unique and handmade Christmas decorations. They make such a great gift or addition to your own home. 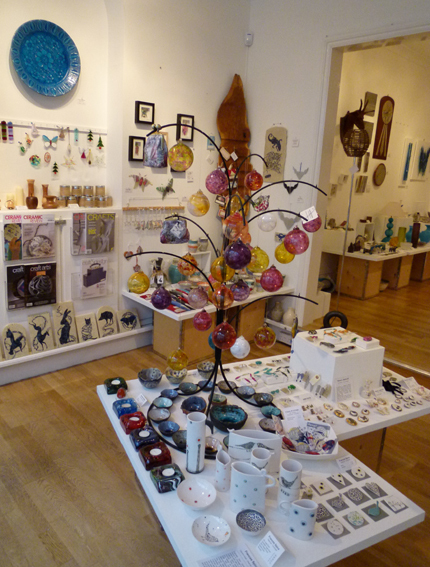 We also have a great choice of glass baubles and small items of jewellery and many other small gifts, as well as special treats. 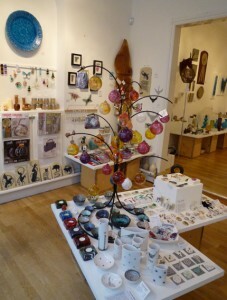 Emmy, who makes the glass baubles has also included some unique vases, which incorporate her knitted copperwire. Almost all our artists have recently delivered new work. A delivery by Richard Glass included these lovely handblown glass robins. Staying with a bird theme. 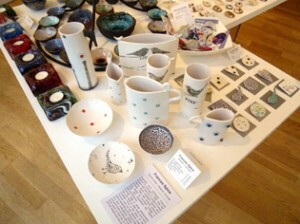 Frances Spice has delivered more jewellery as well as bird vases and bowls. Melanie Guy has sent us a great selection of pewter dishes in various sizes as well as paperweights, coasters and two clocks. The latest arrivals of clocks by Sarah McCormack have sold quickly, but we still have two left and we are hoping to receive more soon. 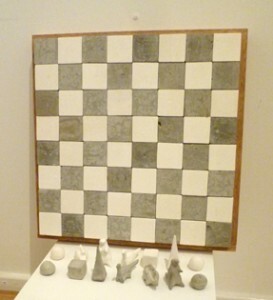 Entirely new to 45 Southside are chess and mini chess boards by Thais Lenkiewicz. Another great present. 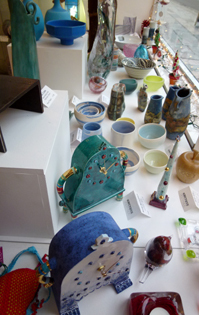 This entry was posted in Gift ideas, New Work, News Overview and tagged ceramics, frances spice, gift idea, glass, Jewellery, Kate Packer, melanie guy, Metalwork, pewter, richard glass, Sarah McCormack, thais lenkiewicz, vase on December 5, 2013 by 45 Southside.